Product categories of Vermiculite Tile Roll Forming Machine, we are specialized manufacturers from China, Vermiculite Tile Roll Forming Machine, Automatic Profile Rolling Machine suppliers/factory, wholesale high-quality products of Aluminum Roofing Forming Machine R & D and manufacturing, we have the perfect after-sales service and technical support. Look forward to your cooperation! It is modern,environmental and nice appearance. Hydraulic motor drives. One single-head structure. It has a pressing arm to prevent the coil loose. Electric uncoiling, hydraulic motor tenses the coil inner. The max. coil inner-diameter is 508mm. The max. coil outter-diameter is 1200mm. The max. width of coil is 1250mm. The max. capacity is 5 tons. Welded steel structure base, chains transmit, motor drives it. The machine include the filming device . The roller is designed by Germany software COPRA, and has FEA analysis, which can promise the product precision. 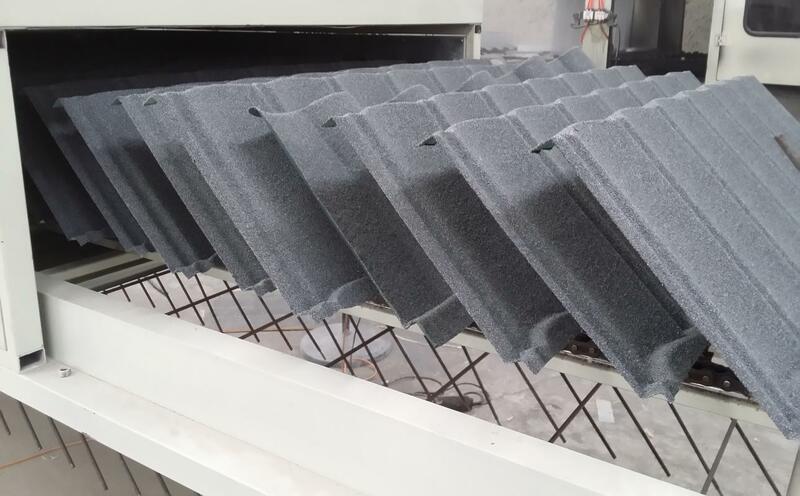 Stop to press, Stop to cut, Post cut .Cutting tool material: Cr12, pressing tool material:40Cr. Tolerance of the cutting length ±2mm. It is 2 parts, 6 meters total. It offers power for the cutter. It uses Siemens PLC system to control the whole line. It can measure and cut the length automatically. Frequency adjusts the speed and it has the self-control speed function. Human-machine screen, touch screen control. The length can be set in touch screen freely and operation is simple. The surround connecting wires adopts aviation socket or fast-speed plug. To protect the workers safely when working.